DETAILS: Situated on Destin’s pristine white beaches, Villa Coyaba’s 2,200 square foot luxury condominiums offer guests a beach haven of rest and relaxation. Featuring 4 bedrooms and 3 bathrooms, this sophisticated, third floor unit comfortably accommodates 12 guests and features top of the line furnishings, a Gulf front balcony with an unbeatable view, fully equipped gourmet kitchen and complimentary beach chair service during season. Villa Coyaba is nestled on Scenic Highway 98 and provides guests the convenience of being a short drive away from all of the world-class shopping and dining Destin has to offer. Girls 60th Birthday Celebration 8 Fabulous Women who have been friends since gradeschool, traveled to celebrate their 60th Birthdays. It all came together perfectly. The condo was beautiful, the pool, beach and sand wonderful. We found great restaurants and shopping. Most of all we enjoyed every minute of our time spent together. We would definitely come back. Only suggestions were Beach towels and enough chairs for 8- even if they were fold up chairs to carry down. We ended up purchasing these at Publix and gave away on our departure. Would have left in condo had we thought they would be kept there for other guests. We had a wonderful visit! The location was absolutely perfect!!! The WiFi was slow—that is our only feedback. The condo was clean, spacious, and beautiful. We hope to return! Villa Coyaba #308 was as close to perfect as it gets! The accommodations were spot on for our large group. We had one minor issue with a clogged tub but maintenance was there to resolve it within 5 mins. The service here is second to none. We will most definitely be returning in the future. 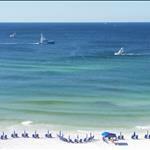 We are so delighted that you enjoyed your vacation with us in Destin! We agree that the condos at Villa Coyaba are second to none. The photo you shared is breathtaking! It's clear to see why Villa Coyaba is a popular destination and we do hope to see you here again soon! Villa Coyaba #308 is a beautiful condo! Perfect location, beautiful views, plenty of room, and so very clean! 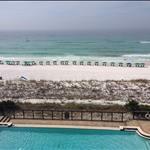 This condo is top of the line and now our favorite place to stay in Destin! The 360 Blue staff (thanks again, Austin :)) was so helpful and exceeded all of our needs and expectations! We will be back! 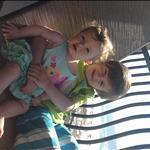 We are so delighted that you had such a great vacation with us in Destin! We agree that these condos in Villa Coyaba are second to none! We are so glad that you had such a great experience with us at 360 Blue and we hope to help you in the future! We had a great family vacation in Destin, we stayed at the Villa Coyaba. The condo was fabulous and the view was breathtaking. We would get up early set out on the balcony with our coffee and watch for dolphins which we seen a couple. 360 blue has a great staff, we would definitely stay again and recommend to our friends and family. Thank you for a fabulous time. We are so delighted to hear how much you enjoyed your vacation with us in Villa Coyaba! 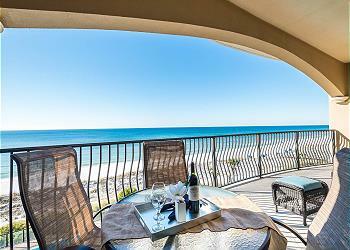 We agree that these condos are in the perfect spot to enjoy everything Destin has to offer, not to mention the view! The photo you shared is gorgeous and shows just how wonderful that view is! We hope to host you and your group here again very soon! It sounds like a truly incredible beach getaway! We love Villa Coyaba and are thrilled you found a home away from home to return to every year! We look forward to seeing you back again next year! The condo was amazing! Everything you need in a home away from home! The balcony and view was amazing. We saw Dolphins on our last morning there, so fun watching them play in the ocean. Two beach chairs per condo were set up and marked daily for us to use at the beach. The pool was nice and warm since the weather was a little breezy. The picture is the gorgeous sunset from the balcony! We will stay again!!! Condo 308 was wonderful! It is such a pleasure to know that you found the condo to be amazing! The picture you provided is a perfect representation of the wonderful views that can be seen from the balcony. Watching the dolphins play in the ocean is enjoyable for everyone, and the beach set up provided makes it easy! We agree that the beachfront pool here is refreshing and second to none. 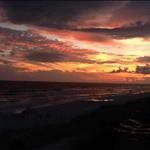 Thank you for the picture of the gorgeous sunset and for your feedback on the condo! We had our entire family for Thanksgiving and it was great! We loved the easy access to the beach and the heated pool. Our unit was beautifully decorated and accommodated our 8 adults and one 10 year old comfortably. We enjoyed the balcony and view. We had a few minor issues when we arrived, but 360 got the maintenance men there right away. We had a great time! What a great family photo! We loved having you with us and we are so thrilled that you enjoyed your stay in this beautiful home. We look forward to having you back soon! Always love time spent at Villa Coyaba. Perfect weather. Beautiful sunrises and sunsets. Can’t wait for the next time!! The sunsets from the balconies at Villa Coyaba are unbeatable! We loved having you with us and hope to see you back soon! This is our 9th year at Villa Coyaba and we always enjoy the property, location is excellent. 360 Blue does a great job answering quickly if we need anything. What a great group photo! We are so happy to hear that you enjoyed your stay with us so much! Thank you for choosing 360 Blue for your beach vacation. We look forward to helping you plan your 10th visit! Everything is always wonderful staying with 360 blue. We are delighted to hear you had another great stay with us! Thank you for continuing to choose 360 Blue for your beach vacation. We look forward to helping you plan your next stay with us! Our party of 9 really enjoyed our stay at Villa Coyoba. It was very clean and spacious. I highly recommend this condo! We would like to thank the 360 staff for everything they helped us with. We could not get home due to the hurricane and their staff was very accommodating with extending our stay. What a beautiful photo! It practically oozes relaxation. We are so happy to hear that you enjoyed your stay with us in Villa Coyaba! We are delighted to help our guests when situations arise, and are happy to hear that we could take care of you so well! Thank you so much for choosing 360 Blue and for taking a moment to share your experience with us. Come back and visit us again soon! Thank You for a wonderful stay this week! Beautiful Condo 308 is just the place to stay! What a great family photo! 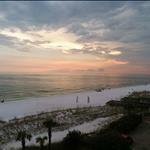 We are thrilled you had such a wonderful time in Destin! Thank you so much for staying with 360 Blue and be sure to come back and visit us again soon! Really enjoyed our stay at Villa Coyaba! Everything was perfect. Thanks to the staff at 360 Blue. Had one problem with a toilet and they were there in minutes to repair. I would recommend this condo to anyone with a group of 10. Plenty of room. Thanks again for a wonderful stay. We are so happy to hear that your group enjoyed your time with us in Villa Coyaba so much! We know just how important it is too have plenty of space for large groups! Thank you so much for choosing 360 Blue for your beach vacation. Be sure to come see us again soon! Villa Coyaba #308 was a perfect condo for our 8 adult family vacation. This is the third time we've stayed at Villa Coyaba and it never disappoints. The unit did have a couple issues that need to be addressed...middle bathroom toilet water pressure very low and turnstile microwave plate was broken. All minor issues that were reported on departure and I'm sure will be addressed for the next guests. Villa Coyaba remains a favorite spot in Destin and we will book again soon! Such an incredible sunset! We are so happy to hear that you enjoy Villa Coyaba as much as we do. It is truly a treasure. We are happy to report that the water pressure and microwave have been repaired. We look forward to having you back soon! Two families stayed for a total of 8 people. There was plenty of room in the condo, it was very clean and comfortable (with the exception of master bed, needs replacement asap!!) The location of the condo was perfect, there is a bar/restaurant night door - 790 Club and you could walk down to the Crab Trap for lunch/dinner which we did on several occasions. I love that there were hair dryers in the bathrooms and coffee left to brew. The washer and dryer are very loud so we did all of our loads during the day. The weather was good (2 rain days) and we enjoyed our time at the beach. We used the pool a couple of times which was a great size and very warm even for my liking. We would definitely stay again and recommend Villa Coyaba to friends or family. We had a late afternoon flight and were allowed a late check out, that was really appreciated! 360 Blue is very accommodating. Thanks for a wonderful stay!! Such a perfect photo! We are so thrilled that you had such a wonderful stay! We loved having you with us and can't wait to have you back. Perfect vacation! Condo was awesome and had everything we needed. Beds are all comfortable. Shopping, golf, theatres and great restaurants. Spa was nearby too. The view from the condo is to die for. This was a ladies trip that we plan to do again. Staying at Villa Coyaba Unit 308 was perfect! Cant wait to come back! What a gorgeous photo! Looks like it was the perfect beach day! We are so happy you had such a wonderful stay in Villa Coyaba! Thank you so much for staying with 360 Blue and we can't wait to have you back at the beach again soon! Villa Coyaba is a nice community and we found 360 Blue to be very accommodating regarding our needs and requests. Our unit was well appointed with furnishings and appliances, however the carpets were stained in some rooms, the couch was stained and two of the bedrooms looked like there had been people laying on the beds prior to our arrival. Our major complaint would be the parking situation, of which we alerted the Managment company. We had a handicapped aunt who was unable to park in a handicapped space because they were taken by cars without handicapped tags or stickers. Also, we had people who parked in our unit space, people who double parked behind cars which made it difficult to drive in the garage, and there were people who parked along the wall of the garage, again making it very difficult to maneuver a car through there. It was extremely stressful every time we drive in or out because we had no idea what the parking garage was going to be like. We are thrilled to hear that you enjoyed your unit but so sorry that the parking garage caused such an issue for you. We are speaking to the HOA for the building to see what measures can be taken to ensure this situation is improved. We appreciate your feedback and hope to see you back soon! We are so happy to hear that you had such a wonderful time in this beautiful condo. The beach at Villa Coyaba is breathtaking. We are so grateful that you chose 360 Blue and we look forward to having you back soon! On a family vacation and celebrating a birthday. My experience can be summed up in two simple words. Love it!!!! We are thrilled that you had a such great birthday and honored that you chose to spend it with us! We hope to see you all back soon! We have had an amazing week! East coast/west coast friends enjoy some quality time together with our babies! This is a great location, great condo and we would stay here again. We spent most our days on the beach and the pool. Our kiddos really enjoyed themselves too!!! Hi Shy Family: Thank you for staying with us at Villa Coyaba 308! 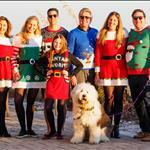 We are happy to hear you were able to have a great week with family and friends. We appreciate you sharing your experience with us! We hope you'll stay with us again in the future. Villa Coyoba was everything we were hoping for: location, furnishings and amenities. 360 Blue was professional and provide great service every step of the way. We have stayed in many places all along the Destin area, best place so far!! Great vacation experience!! You can't beat everything that Villa Coyaba has to offer! We are so happy that you loved it as much as we do. We hope to see you back soon! Family gathering was awesome. We had plenty of room for all of us (8 adults) The kitchen was stocked with everything we needed. The beds and furniture were all comfortable. We wanted for nothing! Perfect stay!! Thank you for staying with 360 blue! We are so overjoyed you and your family had such a wonderful trip! We hope you come back and visit us again soon! Toes in the sand, just how a vacation should be! Thank you for staying with us at Villa Coyaba. We are so happy you and your family love this condo as much as we do! Thank you again Posey Family!! See you next time! Love that view from Villa Coyaba! We're so happy unit 308 offered everything you and your family needed, including that incredible view! Glad you enjoyed your stay!! Give us a call soon to plan another trip! Thank you!! Thank you for a wonderful, relaxing stay at Villa Coyaba! My family had an enjoyable week in Destin despite the rainy weather. The condo was spacious and very comfortable for all eight of us. The pool was as warm as bath water and entertained my grandson and my adult children. We made good use of the gym with a beachfront view as well. The balcony was larger than normal and had ample seating for all. I especially enjoyed the rocking chair with my granddaughter. I would love to visit again in the future. We are so glad you and your family enjoyed your stay. It is such a wonderful area (even in the rain). You truly cannot beat those large balconies at Villa Coyaba overlooking the pool and the gulf - so serene. Give a call when you're ready to come back! We have had a wonderful time and staying in condo 308 has helped make it that way. Plenty of space, wonderful beds, the best view ever. Home away from home. Thank you. Thank you for sharing! We are glad to know you call this place home....come back soon! Words can not describe our week. The weather was perfect! No rain for the golfers and the beach bums! Cant wait till next year! 308 is absolutely beautiful. Everything was great. Thanks 360 Blue! Thank you Dean Family, we can't wait to have you all back. We promise to leave everything just the way you left it.